Summarise the information by selecting and reporting the main features, and make comparisons where relevant. Write at least 150 words. The pie charts compare the distribution of employed British men and women working over different hours bands in the government and private sectors over the year of 2014. In the government, there were 4% of the males dedicated more than 45 hours to their work while only 2% of the females tended to work over this hours band. The most common number of hours that both men and women worked was between 16-25 hours per week (55% for men and 40% for women). 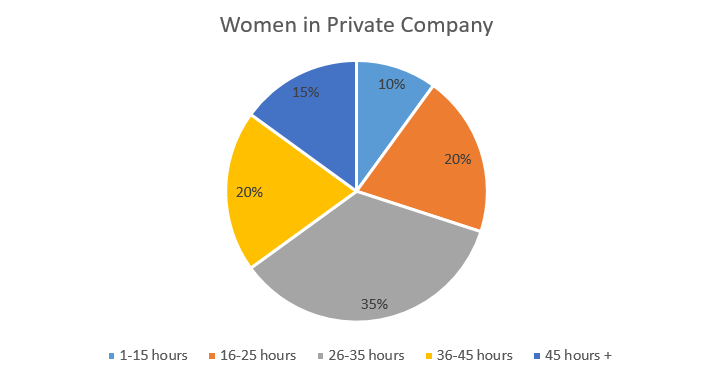 As for the situation where people worked in 1-15 hours, women represented 25%, going slightly over the males that accounted for 20%. In a similar pattern, the females working for 26-35 hours outnumbered their male counterparts by 5% (20% and 15% for each). It is also noticeable that the percentage of the female workers working for 36-45 hours was nearly twofold as much as that of the males. 题目：When new town is planned, it is more important to develop public parks and sports facilities than shopping centres for people to spend their free time in. Do you agree or disagree? In contrast, shopping centres seldom fail us in terms of their functions. Not only are supermarkets and chain stores set in the area, but also a variety of entertainment services, such as cinemas, restaurants, beauty salon and DIY-workshops. People can buy necessities with great convenience from a number of choices, or gather with friends and family to savour a delicious meal there. Life becomes more colourful and diversified thanks to such multi-functional malls. On a larger scale, such commercial centres play an indispensable role boosting the local economy. When starting a new business, the stores and restaurants often require staff for managing, selling and cleaning, which creates many job opportunities for the residents nearby. If well managed, the shopping centre can develop and form its own style, attracting visitors from other places, along with a flow of financial income to the business and government as a whole. To conclude, while public parks and sports facilities are very desirable for a new town, the benefits they bring us are somehow too ideal rather than realistic. However, it is the shopping centre that ensures a tangible outcome for both the individuals and the government in the local area.